This lucky little girl will grow up with the story that she was born during her grandpa’s run for U.S. Senate. How many kids can say that? 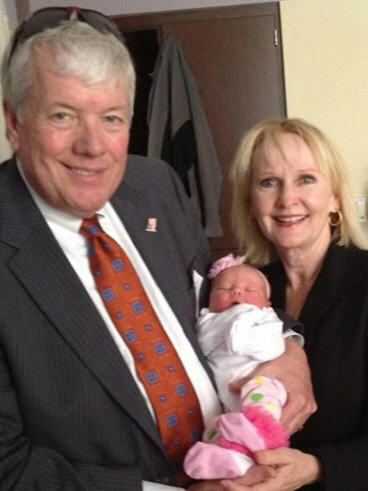 Congratulations to Mr. and Mrs. Sid Dinsdale on the birth of a new granddaughter, Violet Grace. U.S. Rep. and Mrs. Jeff Fortenberry recently spent eight days in sunny, oceanside Cartagena, Colombia, courtesy of the Aspen Institute. Roll Call’s Political Money Line column reports that the Fortenberrys were among of a contingent of 19 members of Congress (most with spouses) who went to Colombia for an “educational workshop.” The value of the Fortenberrys’ free trip was reported at $5,775. If you missed the dust-up between Republican Senate candidates Shane Osborn and Ben Sasse, you didn’t miss anything unless you are on the far-right fringe of Nebraska Republicans. It all started when Poltico posted a story linking Sasse to a Washington firm’s early jump on the let’s-make-money-from-Obamacare bandwagon. The Weekly Standard then came to Sasse’s defense, saying that it wasn’t true and that the Osborn campaign was peddling oppo research to Politico. Some third party jumped in with old stories about Osborn’s nasty divorce and, well, the fight was still making headlines on Sunday. Basically, the Politico story suggests that Sasse took the expertise he gained working for former Health and Human Services Secretary Mike Leavitt to the consulting firm Leavitt started after leaving President George W. Bush’s administration. Sasse says he never made a dime from Leavitt’s firm — and that he never even really worked there — despite his name turning up on some documents and PowerPoint presentations, and former co-workers remembering him at events where Leavitt’s company wooed potential clients looking for help with Obamacare. So what are Osborn and Sasse fighting about? Which one of them hates Obamacare most, who started hating it first, and how could Sasse even think of making money from the Affordable Care Act if he hated it so much? uVoted4them.com rates this fight as a backseat squabble that needs to end before somebody’s dad stops this car. The May primary is still seven weeks away, but the Sasse campaign has started distributing 14,000 pounds of yard signs. We haven’t seen any signs yet, but uVoted4Them.com already misses the Lincoln city ordinance that limited campaign signs to the two weeks before the election. By the way, you have the Legacy Foundation Action Fund to thank for Sasse’s new campaign ads. According to Federal Election Commission filings, the conservative group is spending $25,000 on internet ads and $286,160 on television time. There’s a fascinating piece by Dan Balz in Sunday’s Washington Post about how new media consumption habits are changing campaign ad strategy. Less than half of voters (48 percent) say that live TV is their primary source of video content, so politicians are having to diversify their ad mix for those who mostly use steaming video or video on demand. For those 52 percenters, like uVoted4Them.com, who don’t watch live television, you can see Sasse’s new spot here.